Vano Kalembe Kiboko, a United Methodist lay evangelist, prays in civilian prison in the Democratic Republic of Congo. He led hundreds of people to Christ while in prison himself. A political dissident who led a prison revival is now free in his native Democratic Republic of Congo after 16 months behind bars — the past four in a military prison. Vano Kalembe Kiboko — a United Methodist lay evangelist, businessman and former congressman in Congo — was detained on what the watchdog group Human Rights Watch called “trumped-up charges.”That all changed May 5, when authorities released Kiboko. For his sister — the Rev. J. Kabamba Kiboko, a member of the Texas Conference who also serves on the Judicial Council, The United Methodist Church’s top court — his 492 days in prison made her feel like both of them were in a deep pit. Her brother’s release, she said, occurred after he pointed out mistakes in the judgment against him to a judge. “He fought and he won,” she added. She has since encouraged her brother to secure visas to visit his doctors in the United States, Belgium and South Africa. “Spiritually, he’s very strong… but his health is not good,” she said, noting that he thinks he may have been exposed to a slow poison while in prison. “There have been many, many prayers from the church,” he said. 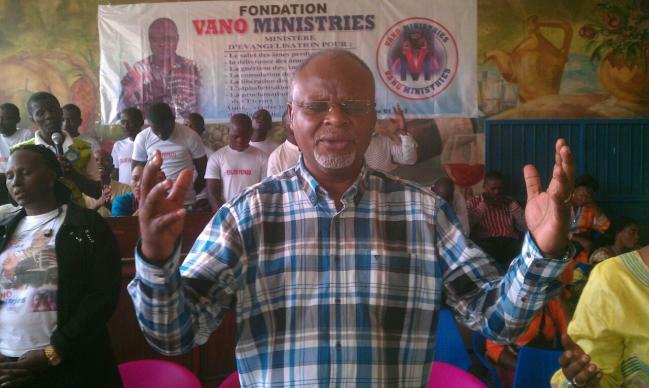 Vano Kiboko was arrested Dec. 29, 2014 by the country’s secret service. His arrest came after he publicly denounced the Dec. 8 shooting of a woman, who was engaged in a nonviolent protest. During the same press conference, Kiboko said the country should not amend its constitution to allow President Joseph Kabila to run for a third term in 2016. On Sept. 15, a court sentenced Kiboko to three years in prison for “incitement to racial hatred, tribalism and spreading false rumors.” His family and human rights advocates disputed the charges. Even in prison, Kiboko continued to follow his call as an evangelist. Like Paul and Silas, he witnessed to Christ’s liberating grace. He preached each week and his family brought food for a communal Agape feast. Through this ministry, more than 700 in the prison made a profession of faith at these services, and Kiboko, with his bishop’s blessing, baptized more than 300. The prisoners called the work Vano Ministries. But in January this year, the government transferred Kiboko to a military prison, where he faced more restraints. He no longer could evangelize or aid his fellow prisoners. His siblings never ceased their advocacy for Vano Kiboko’s release, urging United Methodists to contact their national leaders to help secure their brother’s release. They were particularly concerned that their brother was not receiving needed medical attention for his diabetes and other ailments. The United Methodist Board of Global Ministries, the denomination’s missions agency, also advocated on Kiboko’s behalf. A mission agency staff member visited Kiboko in prison in May last year. Other United Methodist leaders in the international community have been quietly working in the background as well. “We are immensely relieved and grateful to hear about Vano Kiboko’s release,” said Thomas Kemper, the agency’s top executive. Hahn is a multimedia news reporter for United Methodist News Service. Contact her at (615) 742-5470 or newsdesk@umcom.org. Linda Bloom contributed to this report.